Distributed cryptographic ledgers back digital currencies exceeding a cumulative $140 billion in value, at the time of writing. Modern cryptography finally protects over half of all web traffic in the form of HTTP+SSL (invented 1995), according to a Q1 2017 report by the Mozilla Foundation. Mathematically-backed asymmetric encryption is provably safe, freely available, and at long last, widely adopted by the overwhelming majority of digital services that impact and empower day-to-day life for most people alive on Earth today. Over 40 years of computing advancement history has shown that earliest adopters of technologies tend to be hobbyists, followed by consumers, who are followed by businesses, and finally governments. In this regard, as quickly as digital assets like Bitcoin and Ethereum have taken the hobbyists by storm, and are now penetrating consumer wallets, businesses and governments alike are much slower to adapt and adopt. While some brave speculators are already betting their full life savings on these currencies, many businesses still won't yet take them as payment, and most governments do not even acknowledge their status as “money”. In these regards, cryptographic ledger “blockchain” technology can still be considered in its infancy; the now-famous 2009 whitepaper by the pseudonymous Satoshi Nakamoto describes only the first iteration of a hypothetical use-case, the digitization of money into a trustless and decentralized protocol. The second major iteration on this novel concept yielded Ethereum, a platform and virtual machine far beyond just a currency, supporting complex Smart Contract logic and a new frontier of distributed applications, or “dApps”. Neither is yet fully suitable for enterprise use cases where a degree of regulation and accountability is required. And thus these two applications are only the beginning of a new age in human communication and cooperation. Blockchains have already begun to disrupt the transmission of monies and the execution of software logic, but the ways they will change business logic and governmental process remain almost completely unexplored. It is a field wide open, ripe for innovation and the pioneering of new systems that will form the basis of how commerce, business and governance occur at a global scale, shaping societies and human culture in the coming years, decades and far, far beyond. The future is indeed here. 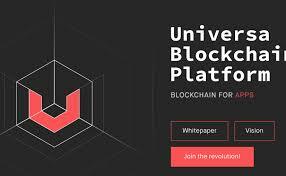 Universa is a company that offers a new innovation in the world of cryptocurrency, especially on blockchain system that has been considered still has the deficiencies as described above. They offer a blockchain system for business platforms for faster, cheaper, smarter contracts and customizable blockchains tailored to our individual needs. This will certainly make it easy for the international class of businessmen who need access to financial transactions quickly and as needed, and will become revolutionary in the world of digital currency. 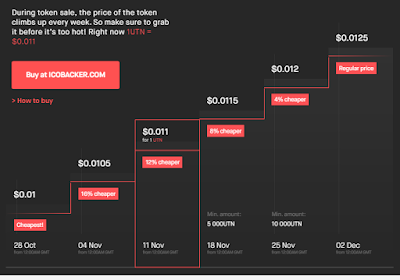 Universa is currently conducting ICO as a means to raise capital from investors in exchange for UTN tokens and some other things. Related to ICO token UTN price and bonus system offered you can see the picture above or also can visit website which link will I share at end of this article.Thank you for visiting.